I have decided that my mother is the bravest person I have ever met and not because she jumps of buildings or swims with sharks or picks up spiders, but because in a small, quiet way and under extremely difficult circumstances she just carries on, expecting tomorrow to the not just another day, but the day she gets better and starts walking again. Maybe it’s lack of imagination, but I imagine it’s more likely to be because she was brought up by parents who survived the war and so RESILIENCE is what she’s learnt to do best. She agreed with my father to take us all to Africa when she was just 24 and we were tiny, despite her father saying it would be “tantamount to infanticide” and then she moved again with him to Hong Kong, staying for over two decades. She just gets on with things. It really is quite amazing and not only that, but she does it with good humour. Which is sort of just as well, because when you’ve been stuck in hospital for two months post her unsuccessful back operation, a sense of humour can be very useful, almost like your shield against the unfairness of it all. We arrived yesterday and she showed us her new “Exercises in Lying Booklet” and instead of showing us the exercises they contained she said with a straight face, “I have blonde curly hair and no wrinkles whatsoever”…. 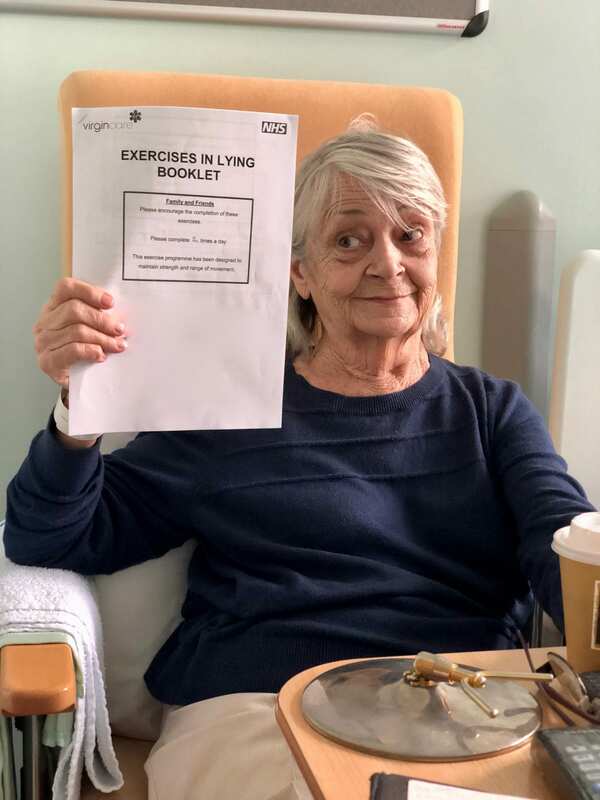 The booklet is of course designed to help her do her exercises in supine position that she can do in her bed, but she was far more interested in amusing us all by making up lies as she went along. She is proving to be remarkably resilient under difficult circumstances. She still hasn’t got the use of her legs back after her operation and so she’s in need of a lot of rehab which we are hoping is going to help her get back on her feet again, literally. My two brother’s and I surprised her with a joint visit to her in hospital yesterday to help her celebrate what would have been her 55th wedding anniversary if my father had still been alive. Not an easy day for her to get through so we brought a little pop-up party to the hospital to help cheer her up and she just seems to accept it all with very good grace. Perhaps therefore things don’t get done as quickly as someone who is demanding, but it works for her. Top respect for an extremely patient patient.